Note: This is another older post (from about 5 years ago) that sank to the bottom of this site’s feed. I’ve brought it back to the top because it’s a good (and easy and fool-resistant) way to make these joints. 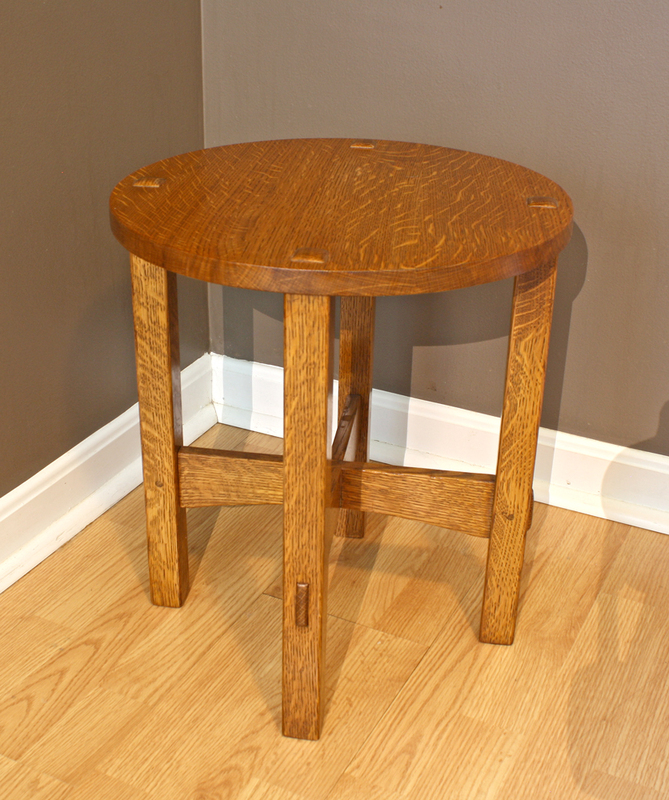 Through tenon joints are one of the hallmarks of Gustav Stickley’s Craftsman furniture. These joints are incredibly strong and they look impressive. This little table is a great project for practice, and it was one of the projects I taught a couple of years ago at Marc Adams School of Woodworking. It’s one thing to make a through tenon on a leg that ends up down near the floor, but when you put one through the top of a table any flaws will be impossible to hide. The mortises through the top need to be the right size and in the right place. I like to make one part match an existing part whenever I can so I don’t have to rely on measuring. After a bit of head scratching (and a jig my friend Dale Barnard uses) I came up with a way to make a similar jig. But instead of starting with the jig, I started at the bottom. The two stretchers connect with a lapped joint, sometimes called an “egg-crate” joint. A vertical slot is cut halfway through each piece, on the bottom of one and on the top of the other. The stretchers pierce the legs with through tenons. After I had the stretchers and legs assembled, I cut 1″ tenons on the top of each leg. Then I was ready to make the jig. Click on the image to watch the video. Bob Lang’s segment is about 15 minutes into the program. Last spring (2013) I recorded this video segment with Charles Brock in the shop at Popular Woodworking Magazine and it has just been released as part of the November 2013 episode of “The Highland Woodworker“. You can see the video by clicking on the photo at right (my segment is about 15 minutes in and shows making and using the jig). In the video you’ll see how I assemble the jig around the assembled legs and stretchers. I cut a strip of 1/2″ thick plywood to same width as the tenons and to a length that just fits in between two opposing legs. The leftovers from the strip go on the far side of the leg tenons and a couple of other strips are glued on the outside. When the glue has dried I have a template that matches the existing assembly and I use a router with a flush trim bit to cut the mortises in the top. A bit of chisel work to square the corners and the top pops right on. Click this image to read the original article from the April 1905 issue of “The Craftsman” available online through the courtesy of the University of Wisconsin. This little table has an interesting history. Although Gustav Stickley’s Craftsman Workshops made round tables in a number of sizes and configurations, this version was not a production piece. It was actually a do it yourself project in the April 1905 issue of Stickley’s The Craftsman magazine. The entire 16-year run of The Craftsman is available online, thanks to the Digital Library for the Decorative Arts and Material collection provided by the University of Wisconsin. If you want to get information on the American Arts & Crafts period from an original source, this is an amazing resource. In addition to articles on home building, decorating and “Home Training in Cabinet Work” you can read about the social and political background of the era. And of course there is a SketchUp model of this project, you can find that in the 3D Warehouse. If you’re a fan of this style of furniture, you should take a look at my book “Great Book of Shop Drawings for Craftsman Furniture”. It’s a collection of measured drawings of original examples of furniture originally made by Gustav Stickley in the early 20th century.